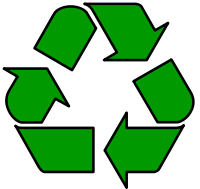 I get a fair amount of visitors looking for the recycling logo, due to the this article: Logo recycling, so I decided to actually make that visit worthwhile, instead of just a “disappointment”. So, without further ado, here are the universal recycling and green point logos. This work was previously under Public Domain, or a Free License. It has been digitally enhanced and/or modified. This derivative work has been (or is hereby) released into the public domain by its author, Cbuckley at the English Wikipedia project. This applies worldwide. In some countries this is not legally possible; if so:Cbuckley grants anyone the right to use this work for any purpose, without any conditions, unless such conditions are required by law. Also, it is not unusual to have some path variables with duplicate entries, which is not very efficient. This function makes sure that a path only occurs once, and retains only the first occurrence, thus keeping the search order intact.